This is just a start at a gardening link page. I will be adding more from time to time. Please let me know if any of the links are not working. they all were at the time of putting them up. July 8, l999. These are but a few that have given me so much pleasure and information. Thank you! This is a site for all kinds gardening information in and around the Golden Horseshoe. Give it a look there are so many things I really can't list them all. gardener. Bulbs, soil, hardy perennials, tested links and much more! Buds has a perennial tutorial to get you started in perennials. It even has information about things in Toronto. older fax machine tones, and switch over to receive your fax. seeds. $5/2 years (4 issues), refundable; 90 pages, photos, botanical names. Goodwood Gardens Greenhouses for annuals, perennials, roses, shrubs, vines & house plants, Garden Supplies and accessories. They have both the usual and unsual. really nice selection. Herbal Touch Home Page Lovely gardens devoted to herbs in Otterville Ontario. Marilyn Edmison-Driedger the owner who appears on Kathy Renwald Gardeners' Journal has lovely gardens to walk through and a quaint gift shop filled with all matter of stuff having to do with herbs, including all-season botanical wreaths, fragrant potpourri, everlasting bouquets and arrangements, books about herbs and everlasting flowers (over 100 titles) and her own pecial blend of herbal tea and vinegars. There are also baskets, garden plaques and garden accessories. Orris powder andessential oils are available. Hortico Nurseries Inc. Hortico for roses, perennials, flowering shrubs, evergreens and small trees. They have an online catalogue. Humber Nurseries Ltd. & Butterfly Conservatory "Home of the Unusual Plants". Serving the Greater Toronto Area. Really extensive site. Their store a must see for me spring 2000. They have amazing varieties of coleus, name varieties go early on to get best selection. They run free classes starting May 13 they have short hours of operation so call ahead before setting out. PicovsOur source for great advice and material for our pond project. They have pond equipment, plants and fish for the pond. Richters Herb Specialists Have an online catalogue and ordering. They also have a series of lectures. They start February 15. There is a chart for uses of culinary herbs. The store has an extensive collection of herbs and scented geraniums. Weall and Cullen Nurseries Limited gives you seasonal tips on the garden, online newsletters, store locations and maps. If you know of any commercial links in the Toronto area please email me. The First Sunday in June we set out along the Hwy. 401 and had a lovely afternoon garden centre hopping. I wanted to go to Mason Hogue Gardens and another garden centre I didn't know what name it was but it was just before Richters Herb Specialists. Set out and got to Mason Houge's and found some really unusal coleus and fushias they have so many plants that are different. Then we continued on to that Garden Centre...it is call Goodwood Gardens Greenhouses. It is now in my list above. Where I found lovely annuals perennials and house plants. I bought some really sweet double impatiens, they have tiny flowers and other plants. We went along to Richters Herb Specialists and found wonderful selection of herbs and scented geraniums and many other plants and of course many books and all manner of things herbal. I knew the three were close but didn't realize they were that close. I would like to do this again. My plants of course they were all potted up by evening now I am waiting for them to be all bushy. icangarden is a web site devoted to all things pertaining to gardening all across Canada. There is so much on it. Debbie's Garden Tour Map is a beautiful site and has numerous links and lots of pics that you can see by clicking on her cameras's on her map. Lovely site full of interesting information. Jeannie C Homepage This is a brand new site. Jeannie has sections on her garden, family and cyber friends. A lovely site with great pics and sweet graphics. Ladybug's World of wonder Has lovely pics of her lovely family, pets, home and garden and really sweet graphics. She has redone her site and has more pictures to see. Take look at her dollhouse page. There she has pictures of the furniture and house Ladybug and hubby took one year to build right down to a mini doll house in the dollhouse. It is a replica of their own house. What a great accomplishment. Oh and sunflowers will follow you. Olympic Views Is Kathy Miller's site, my very first cyber friend, has loads of beautiful seasonal pics, garden tours, journal, family recipe's and tons of information about gardening in Washington State, soap making, and much, much more. Matt & Nadine's House of Dogs & Flowers brand new site lots of lovely pics and two lovely doggies. Northern Gardening Tons of links from everywhere to everywhere, Personal Pages, Ponds etc. Rebecca's Herb Patch is all things herbal from plant seeds to making pot pourri and your own vinegar's and oils to herbalist advise. Sharon's Garden has beautiful pages of pics of gardening and other pursuits. She has a garden folly inspired by Virgo's Aussie Garden site. There are some beautiful pages of pics of covered bridges of the area. Virgo's Aussie Garden Home Page - Melbourne, Australia is a lovely site from down under. She has garden tour. Links to Aussie sites, a whole section devoted to Garden follies a must see, theme gardens. and other things to explore. 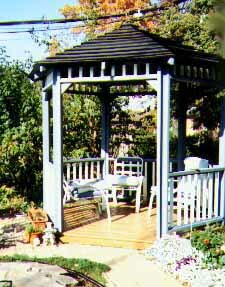 Welcome to Gazebo Hill is has a garden tour, a gallery of her painting, art quilts, birding notes and many other tempting places to visit in her links. Noelle has a beautiful garden in New Zealand. Her site also has links to New Zealand so you can find out about her beautiful country. She has many other interesting things on her site like beautiful one on fairies with lots of link to other magical sites. filled with pages of photos and botanical names. For those who want to try out mushroom growing he has all the supplies you need. and annual seed listing with $25 membership. I have a selection of some of my poems in a new section called poetry pages. In it there are poems I have written over the years. My photographs and painting are used in the background or borders. I have some links to other poetry pages, artist and craft pages there as well..